Hastings United Football Club's progress in the FA Cup came to an agonising end tonight (Tuesday). The U's were edged out 2-1 after extra-time in a closely-contested third round qualifying replay at home to Margate. Despite the disappointment of exiting the world famous competition to a 115th minute winning goal, United can take great heart from going toe-to-toe with a club which plays two levels above them over two games. In fact, they led 2-0 in the original meeting seven days previously before being pegged back by two Margate goals in the final 15 minutes. Margate had the better of the first half of the return match. United goalkeeper Lenny Pidgeley made a fingertip save low to his left from Elliott Buchanan's 25-yard drive, while Manny Parry headed over and Adam Cash shot just too high, both following corners. United then settled and took a 24th minute lead from a corner of their own. Sam Cruttwell scored direct from a flag kick in the first meeting and he was credited with the goal this time too as his inswinging delivery took a nick off someone in a crowded six yard box on its way into the net. Harry Stannard's left-foot shot following a neat turn in the box was saved by Margate goalkeeper Lewis Ward before Margate levelled in the 41st minute. Daniel Akindayini jinked his way past both United centre-halves before scoring with a lovely finish in off the far post. Well-taken from Margate's point of view, too easy from a United perspective. Margate came close a couple of minutes later when Pidgeley dived to his right to parry Buchanan's low volley and fortunately for United, the rebound didn't fall to the waiting Margate attacker. United enjoyed the bulk of the play during the second period, with Margate largely operating on the counter-attack. Attempts at goal were in short supply at either end, though, at least until the latter stages. Ward pulled off a decent save low to his right to repel Simon Johnson's shot from outside the box, while Buchanan's low shot from a similar distance at the other end was well gathered by Pidgeley. As United piled on the pressure in the last few minutes, Matt Bodkin fired just wide of the far post, Cruttwell's volley from a Frannie Collin corner deflected over and Alex Akrofi headed well over from Cruttwell's set-piece delivery. Aside from one nervous moment in United's penalty area, the first half of extra-time was something of a stalemate with the deadlock seldom looking like being broken. In the second additional period, Pidgeley beat away Alex Osborn's angled shot at his near post and then gathered Cash's deflected shot after it had initially gone beyond him. Margate then swooped for a well-worked winning goal. A moved which started with a neat one-two on the away right ended with Buchanan tapping home the rebound after Osborn's initial attempt was blocked on the line. Akindayini wasn't far away with a left-foot curler from just outside the box, while United's last effort on goal saw Collin go whiskers wide from 20 yards. 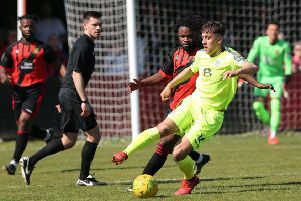 The result means Margate will travel to Harrow Borough in fourth round qualifying this coming Saturday, while United will instead host Guernsey in a Ryman League Division One South match which will kick-off at 1pm. United: Pidgeley, Davies (Temba 116), Butler, Cruttwell, Watt (Cole 57), Rowe, Bodkin, Johnson, Akrofi, Collin, Stannard (Harris 82). Subs not used: Climpson, Pritchard, Nicholls. Attendance: 530.